A superfood is defined as a nutrient-rich food considered to be especially beneficial for health and well-being. If someone said the word 'super food' it may well conjure up images of blueberries, kale, salmon and goji berries. So it should; every single one has a strong case to be promoted to the heady heights of superfood status. I'm putting a little-known green tea forward. It's a nutritional superstar and I think it deserves superfood status. Read on to decide for yourself. Isn’t it just another type of green tea? Well no, it's not, and it all comes down to how it’s grown, processed and – most importantly – how you drink it. Japanese Matcha green tea comes from the same tea plant as all teas but only the youngest, most tender, shade-grown leaves are picked by devoted tea growers. Then comes the clever bit. The whole tea leaf is stone ground with surprising gentleness into a very fine powder which can be mixed with water and drunk rather than being brewed and the leaves (or tea bag) discarded. What that means is you get all the wonderful benefits in every cup– nothing is thrown away. Matcha contains a staggering amount of antioxidants. In fact, 10 x more than regular green tea in only 1 teaspoon. The main superhero here is Epigallocatechin gallate (pronounced Ep-ee-gallo-cat-eh-kin gallate) or EGCG, a phytochemical that slows irregular cell growth, which has potential to prevent some cancers. Numerous foods have amazing antioxidant and anti-aging properties which we are only just beginning to comprehend. But in this regard, Matcha tea blows all other superfoods right out the water. Researchers at Tufts University use ORAC – (Oxygen Radical Absorbance Capacity) to assess the antioxidant power of foods. Matcha came out with an ORAC rating of an incredible 1300 units per gram 13 x that of blueberries and more than any tea on the planet. Once again it's our little-known superhero EGCG that makes Matcha such a staggering food for the skin – protecting it from UV damage and improving skin elasticity. 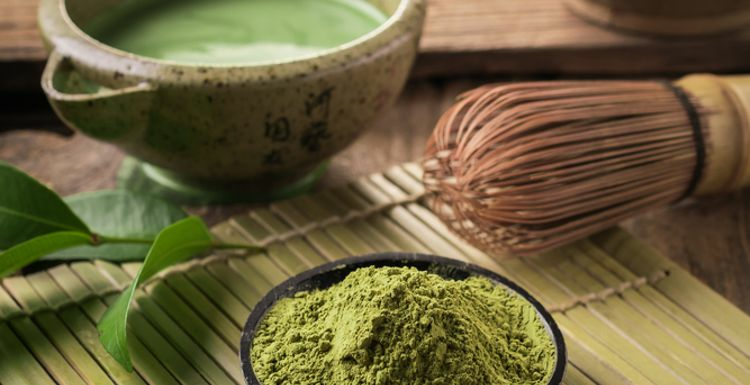 Did you know Zen Buddhist monks drink Matcha tea to aid with extended meditation? The stimulation from the caffeine keeps the monks alert, while the amino acids from the l-theanine keeps them focused and calm. I'm no monk but I'm lucky enough to drink Matcha every afternoon and it provides me long lasting (much needed) energy into the evening. It's true to say Matcha is both a stimulant and a relaxant, which makes it perfect for focusing on work, meditation, exercise or play. Your immune system is the guardian to good health. Keep it strong and it will protect you against viruses and bacteria. Compromised, its power to protect is weakened. Matcha green tea fights bacteria. The magical ingredient here, once again, is L-Theanine (pronounced l-thea-nine). Although we're just discovering l-theanine, what has been verified is its strong anti-viral effect on flu and powerful anti-inflammatory effect on the immune system. A 1999 study featured in the American Journal of Clinical Nutrition proved that once again, those catechins had another superpower. They have thermogenic properties that promote calorie burning. It was found that consuming Matcha increased thermogenesis (the body's rate of burning calories) from 8-10% to 35-43% of daily energy expenditure, and that was sitting down with a resting metabolic rate. There's so much research out there that proves Matcha Green Tea is ridiculously good for you it's impossible to ignore. You don't even have to drink it as a tea - it is a powder after all. Add it to smoothies, bakes, juices, or even sprinkle it on your cereal with gay abandon. However you chose to consume it, this little-known tea with its astonishing nutritional benefits won’t fail to transform your day. Angelina is a blogger and cyclist with a keen interest in nutrition and health. She loves the unique, long lasting focus Matcha tea gives her. www.thematchateacompany.com. I have tried matcha tea at a friends and it tastes quite earthy, but strangely enjoyable because I knew it was good for me I expect! This has me convinced too but I just checked online and it is pricey. A Christmas present perhaps? Ok, you've got me interested. I am now wondering how much it costs?! !